Their last album came a bit as a surprise for me. F.O.D. from somewhere around Antwerp in Belgium play melodic punk rock, a genre which normally doesn’t do very much for me. Often too formulistic, it’s more about style than content. But once in a blue moon, you stumble across the exception to the rule that really catches your attention and even your heart. Three years ago, their second longplayer Tricks Of The Trade was such a rare stellar experience, and I doubted that the guys would be able to top their effort. Well, it took them quite some time to come up with album number three, Harvest, and once again we get seventeen songs, this time running a little bit longer than the last time, allowing the record to make it just over forty minutes. Of course not every song is an instant hit, and who would expect that from seventeen tracks on a third longplayer? And while there are no weak moments on harvest, at least half of the tracks are perfect exercises in multi-vocal pop punk. The songs generally average a little over two minutes, and the first four tracks (41, Crew You, Last and Party At Olm Street 10) are such a furious start into the album that you just want to know what comes next. The following Autism Spectrum Disorder Blues is maybe a little more aggressive but ends up charming you once again with its wonderful chorus. Forever Grateful (For Toon) is one of the longer tracks with a few seconds over three minutes, and shows the band from its more complex side. Starting on an acoustic note, it soon becomes electric and then delivers the band’s trademark vocal harmonies that are the best you get to hear in Europe. And so it goes on, full of great melodic pop punk tracks. F.O.D. don’t hide the fact that they have been influenced by American bands like Bad Religion, Descendents, No Use For A Name, Green Day and many more, but one can never accuse them of just cheaply cloning a genre. Instead they use the aesthetics of the form and add their very own content. F.O.D. are not only great songwriters and good musicians, but they are most certainly blessed with one of the best vocalist and the greatest backing vocalist of all times. 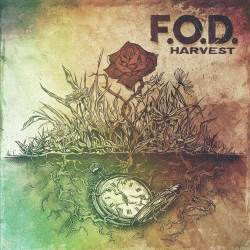 Their last was already impressive but it takes Harvest to prove that F.O.D. are not a one-hit wonder.